How much has your dog cost you? No, we don’t mean adoption fees, vaccinations, microchip, toys, bedding, clothing and food. We mean in damages. Our friends from across the pond just held a competition for naughtiest dog and Rolo, a three-year-old miniature dachshund won the crown. He has cost his owner more than $1,400 in damages. The competition was organized by Terry’s Fabrics, an interior design company, and the grand prize was over $200. Sure, that is nothing compared to the cost the winning dog’s destruction path has caused his owner, but at least the winner takes home bragging rights of being named England’s naughtiest dog. 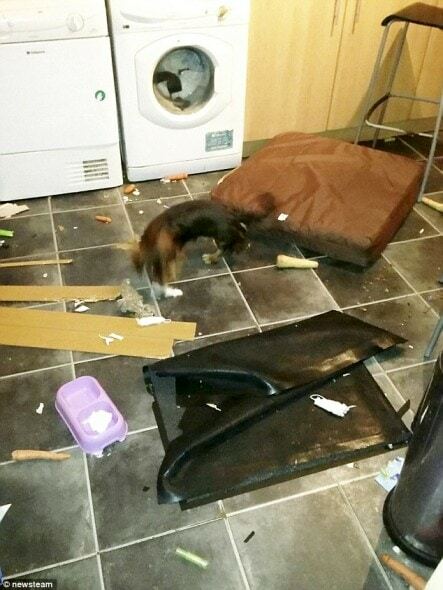 Kelly Mobbs, the pet’s owner, says her little destroyer has chewed his way through cushions, wooden doors, pillows, bin bags, hair straighteners, kitchen chairs, wires and a weight bench. 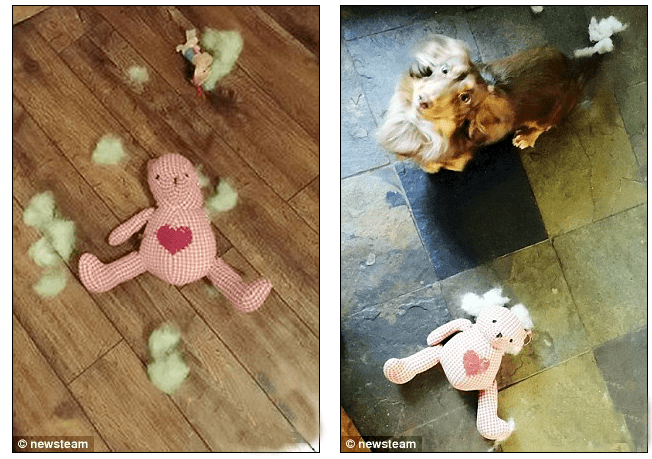 Most of his destruction happens when the dog is left alone, and even though repairing all the damage has made a dent on Mobbs’s pocket, she can’t stay mad at her cute little dog for too long. The prize money is not going towards any home repairs, it will be used to spoil little Rolo by purchasing him toys. They’ll probably keep him busy for a while, but once he is left home alone, we’re sure he’ll find something valuable to chew and destroy. 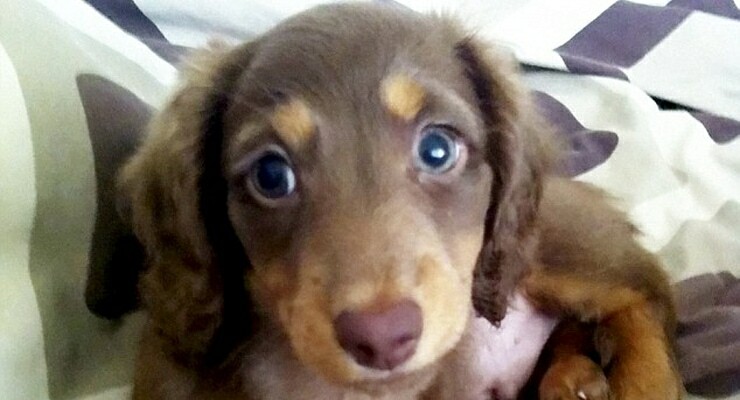 Congratulations Rolo! You truly are a naughty little dog. What a silly article . That’s nothing . . . . Bella has exceeded that! Amy Wright, I bet you have them beat in veterinarian bills!! My 4 have chewed about 13 give or take pairs of shoes through the years…1 pair were $200 boots….yipes! Naughty or Nice those eyes will buy anything. It’s a hell of a lot cheaper to hire a dog trainer than continue to make repairs to your house. He is a cute little bugger though. That is nothing. My dog got sick and cost us 40k over the course of a few years. Worth every penny. My husband’s cat bests him by over a grand. I rescued a boxer/bloodhound..When I got him he was 6-7 mos old..He has eaten everything in my house..He has eaten socks, underwear, eyeglasses, remote control, rugs, carpet & my sectional sofa.Bedding, pillows, comforters, you name it he ate it..He has tons of toys, yes he ate those too including kong..I have not had furniture in my living room for about 2 yrs or so..I have a bed to sleep on..He has finally stopped destroying everything, so now I am going to buy furniture! But he still likes to eat toilet paper! My friends all wanted me to get rid of him, but he is my dog & no matter what I could never get rid of him..He is 4 yrs old now..Here is my baby Bebe.. I wanna party with Rolo! Our dogs were breed discriminated by our home owners association and told us we had 30 days to “get rid of them”. Well they’re family, getting rid of them is not an option. After spending thousands to fight it we won, but no longer wanted to live there. We had to buy a new house (hence the 200k figure). On top of that our male is very unhealthy and has cost thousands in vet bills over the past 2 years. We’re poor as hell but we’d do it all again in a heartbeat. no! 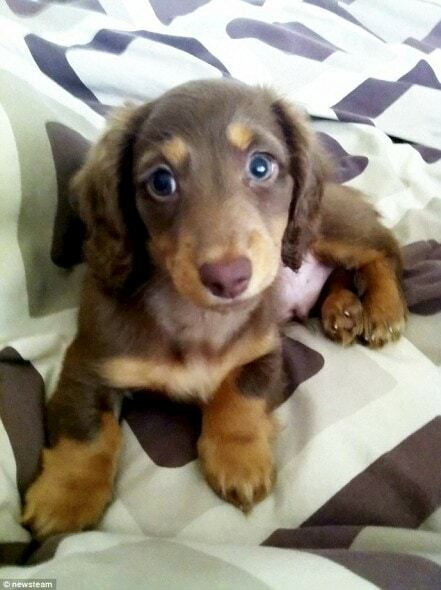 not this cute little puppy..
15,000 worth of flooring…2 rounds! Boy is little man a cutie pie ? Bad fur baby here but still cute of course, blame the naughtiness to the owner for not training, loving, giving proper attention and not this cute little fur baby. That amount was my last pet bill!! You know what they say: Exercise, Discipline then Affection. Perhaps this poor animal was not properly trained! My oldest Standard had bad separation anxiety for the first two years. He literally ate and swallowed almost a whole leather sectional, a dozen or more leather shoes, belts leather coats, and for some reason remote controls. All that is in the past, but the silly part was he wouldn’t be caught dead chewing anything while you were home. He was too embarrassed to misbehave in front of you. We had a very naughty daschund that we had to give back to the owner. But that face is so cute!!! The problem usually is on the upper end of the leash. Can’t blame the dog. My dog notoriously found her way into my bedroom and made “nests” out of my matress. Not separation, and she was run at least a couple hours a day. But I had to replace my mattress 3 times because she was a passionate nest builder. I had a crate for her but she got out one and the other times she snuck into my room while I was making dinner… How can u be mad tho? How can you stay mad at that adorable pup!! At the same time England crowns worst owner. Exercise discipline, affection. Simple as that. Wish we could’ve entered our dog! She’s caused over a £1000 worth of damage by ripping up carpets, digging through settees etc. Nice to know us naughty dog owners aren’t alone ? He’s needs exercise. ..toys that challenge him. .obedience training. ..if you can’t cope don’t have an animal. LOL – You Go, Rolo…! Oh…but he’s so cute !! I know I do in 3:00am vet visit for porcupine quills in the mouth!!! He needs a visit from the dog whisperer. chewed up before the draw and I threw it away, did not look at numbers and forgot where I bought it 🙁 bless Jess Jess!!!! My pup is pretty naughty but not in the sense of destroying things. Lol. pffft – my four have eaten two couches – my oldest liked the taste of drywall when she was a puppy…. He us soooo cute! ???? I bet they still love him….. Ya probably because he was never taught not to do it..just left do what he wants.. for to long..and the longer it is the harder it is to get them to stop..teach them as soon as you get them..